RAWERS ARE HANDY THINGS. No, not the furniture, but people who draw. If you ever need a particular illustration, maybe you can’t quite find the right photo, or maybe you’re looking for black and white line art, then you’ll be looking for someone who can draw. I wanted a picture of Pope Francis for the house. Not too big, something sort of subtle to glance at during the prayers for the Pope with the family rosary. My husband does portraits and this is his drawing. My husband can draw, enjoys drawing, spends hours drawing. I can leave the drawing to him. He may assure me that I could draw passably well if I were to practice more, but that will probably have to wait until the next life. For me, drawing seriously is too difficult. There are times when I’ll want a baritone for some harmony, and I will turn to my husband. He has a good voice, a sharp sense of pitch, does a good Bing Crosby impersonation, but no way will he sing in a choir. For him, singing seriously is too difficult. I was brought up with the firm notion that Everyone Can Sing. At home and at school there was much time spent getting people to sing, to open their mouths, to project, even just to breathe and Stand Up Straight. People who did not were just not trying hard enough. It left me with little empathy for those who do not sing. But now I’m coming to terms with the idea that some people will not sing, at least not in this life. Maybe everyone who can speak can sing, just like everyone who can rub a pencil on paper can draw, but how much time and effort you have put in makes all the difference. In the meantime, if you need a drawer, there’s my husband’s business Avalon Prand. 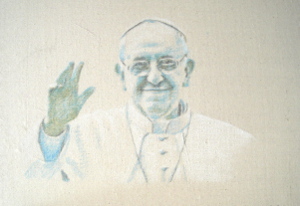 Prints of Pope Francis are available through RedBubble.